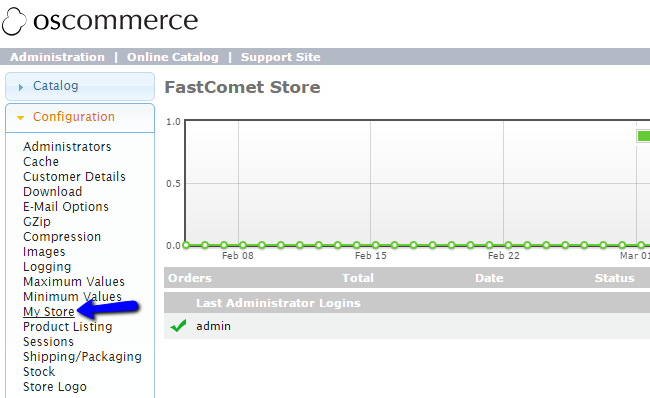 This tutorial will review the basic configuration of your osCommerce store. This is a good way of editing the general information for your website, such as the name, email, address and much more. First and foremost, you will have to log into your website as administrator. Click on the Configuration tab from the main menu and then My Store. If you wish to change any of the options, simply click on it. For example, we will change the Store Name so we can clicked on it. On the right side of the screen, you will notice a box, where you can enter your new store name. Click on the Save button to update the option.